We cleaned out and defrosted our freezer this weekend, in a moment of spring cleaning and to increase the freezer’s efficiency. We had done a pretty good job of eating all the meat, stews, and vegetables we had stored in it, but there were a few things left, including a pie crust and a container of cranberries. And what does one do when “forced” to remove a pie crust and cranberries from the freezer? Make pie, of course! 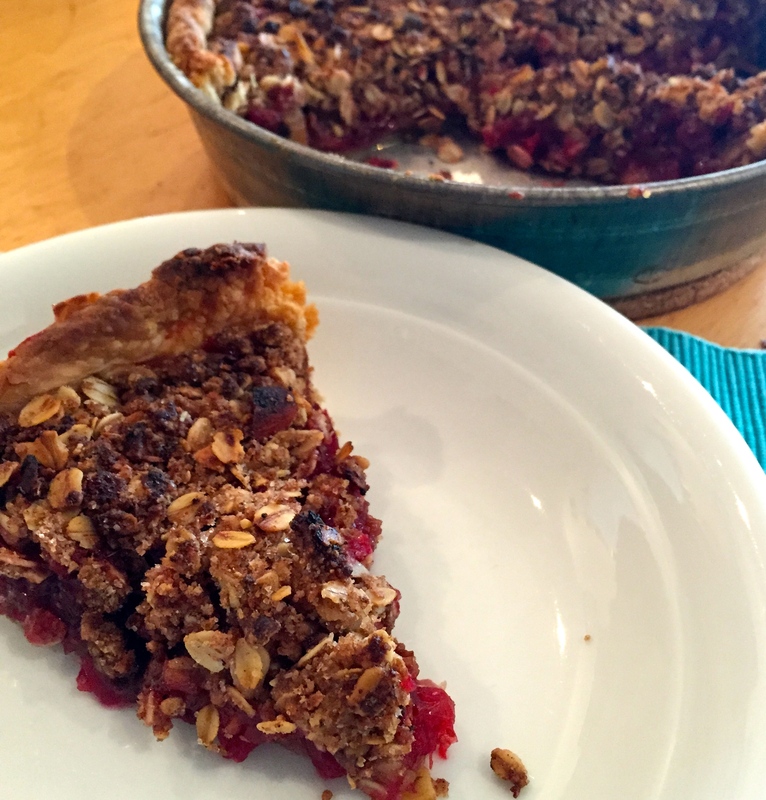 This cranberry-apple pie was inspired by Joy the Baker’s apple cranberry crumble pie and smitten kitchen’s cranberry pie with thick pecan crumble. It is more heavily adapted from the latter recipe, but I made a few adjustments — whole oats and whole wheat flour for the crumble, an apple to bulk up the fruit, lemon instead of orange zest — based on my instincts and what ingredients I had around. The pie is lovely: a nice, tart filling is nestled between a sweet and crunchy topping (I’d use less sugar in the crumble next time) and a flaky crust. F deemed it delicious and so did I. Serve it with a dollop of yogurt and you’ve got a perfectly acceptable breakfast or brunch! Make the crust: In a mixing bowl, whisk together the dry ingredients. Use your fingertips or a pastry blender to work the butter into the dry mixture until it makes a coarse meal. Add the cold water and stir with a wooden spoon until the dough comes together in large clumps. Knead the dough together with your hands until it forms a ball. Wrap the dough in plastic and chill for at least an hour (or freeze it for 15 minutes if you’re in a hurry). Once your dough has chilled, flour a countertop and roll the dough out into a large circle. Transfer it carefully into a pie dish or other round baking vessel (I used a round cake pan). Press the dough gently into the dish and fold over the edges, crimping if you like. Put the dish into the fridge while you make the filling and topping. Make the filling: In a medium saucepan over medium heat, combine all of the filing ingredients. Let warm for 5 minutes or so, stirring occasionally. Take the filling off the heat while you make the topping. Make the crumble topping: If you haven’t already, chop your nuts finely with a knife or by pulsing in a food processor. Combine the nuts, oats, flour, sugars, and spices in a mixing bowl. Stir to combine, then add the melted butter and stir until the mixture is coated evenly. Take the crust out of the fridge and pour the filling into it, then sprinkle the topping evenly over it. Bake for 40-45 minutes or until the topping is lightly browned and the filling is bubbling (you may have to cover the pie with foil halfway through so the topping doesn’t burn). Let cool and serve with yogurt, whipped cream, or ice cream. This entry was posted in food, health, pictures, recipes and tagged apple, brunch, cranberries, crumble, dessert, Joy the Baker, life, pie, smitten kitchen on 22.03.2015 by taplatt.